Nokia Lumia tips: Read text messages aloud/say incoming messager’s name. 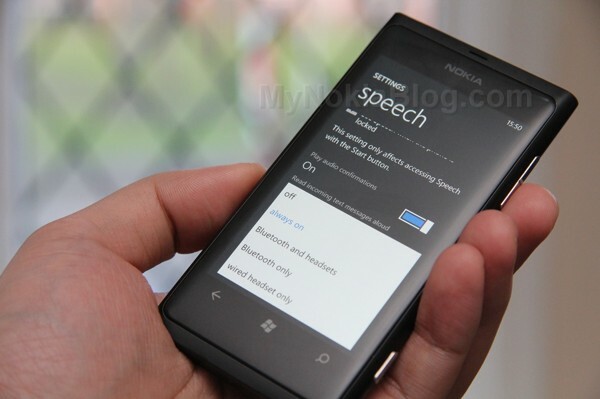 Remember the post where we talked about some Voice Command features for the Nokia Lumia? There’s a really neat feature that I didn’t get to demo personally because I didn’t have it activated (and didn’t see it in settings at the time). The feature you may have seen before allows you to get the phone to read the message out to you and you can even reply to it. By default it is active for bluetooth headsets but you can set it to work any time you have your profile to ring&vibrate. Settings>Speech>Read incoming text aloud ‘always on’. Done. Early morning, still in bed. Received a text. You might not know where the darn phone is or might be too tired/lazy to get out of bed or don’t want the brightness of the screen to stab your low light adjusted eyes. Preparing food in the kitchen, hands might be dirty. Get the text read out. Sorting out the kids, but need to read text. Multitask. Also just hearing who the text is from is cool anyway. If you’re already in the middle of a text convo, the phone won’t read out loud and will let you carry on just typing. You’ll see a notification anyway who it is with a little excerpt of the text. The only downside is perhaps your ex hearing you say ‘ignore’ to her text messages or other people overhearing your text messages. We showed this to Steve our smartphone n00B and he’s using it all the time. Got my mum in using this too. Some neat touches are that it can read out some shorthand, e.g. LOL, x (as kisses), and smilies. If you’re not in an environment where you want your messages to be read, you might just have your phone on silent. If so, it won’t read your messages or give you voice notification of incoming messages. I’d like to emphasise the reading of the text bit. Replying to text by voice is good if you have a short reply or a long one without pauses. Otherwise, like with pretty much all speech to text, it’s sketchy. « 12MP Lumia 900 to Come to Carriers in May?? ?